When I pick up a Costco-sized carton of blueberries, there’s always a mad dash to make a bunch of blueberry recipes before they go bad. My family’s favorites are blueberry pancakes and coffee cake, of course. 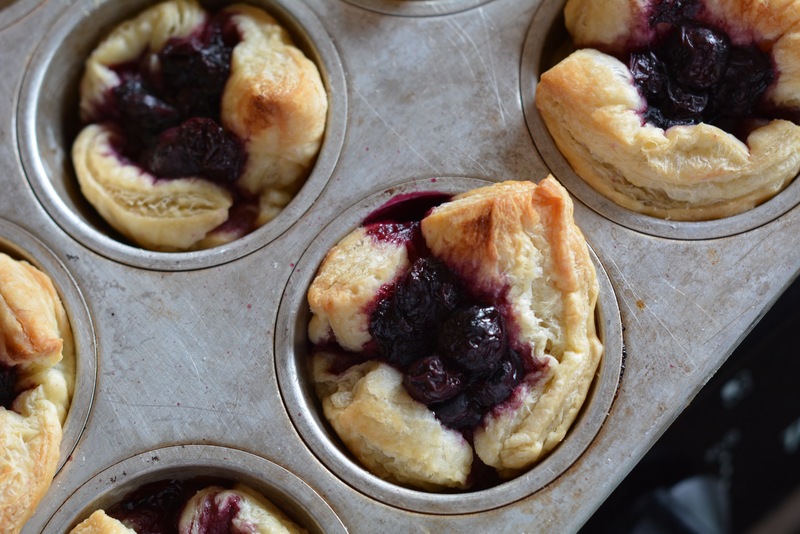 We’ve also gotten into making these sweet little blueberry pie cups. My daughter came up with the term because they are basically pretty little blueberry pies baked in muffin tins. 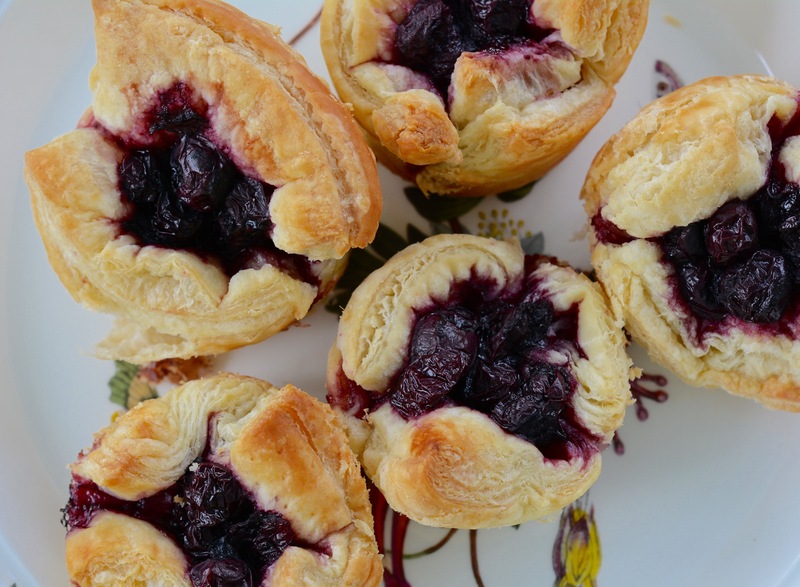 They are so simple to make because I used puff pastry instead of making crusts from scratch. We make the basic pie filling in a large bowl, scoop it into the pre-baked puff pastry crust, and bake them up. They are perfect bites to end the day or serve at a gathering with friends! Step 1: Preheat the oven to 400 degrees F. Spray the inside of 12 muffin cups. Place the puff pastry squares into the muffin tins and pleat the sides as needed to fit the puff pastry. Poke each puff pastry sheet with a fork tine several times. Brush with the beaten egg white and bake for 15 minutes, or until slightly golden brown. Step 2: While the puff pastry is baking, combine the blueberries, water, sugar, cornstarch, and lemon juice in a small saucepan and bring to a simmer, stirring just until the sugar is dissolved. Step 3: Once the puff pastry is finished, remove it from the oven. Scoop the pie filling into the puff pastry cups until ¾ full. Return them to the oven and bake for another 5 minutes, or until the filling is bubbling. Then, remove it from the oven to cool. Step 4: Use a fork to remove the pie cups once they are cool enough to touch. Transfer them to a wire rack to cool completely.